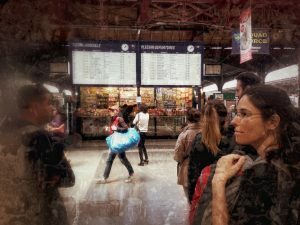 Traveling by train has always fascinated me! Maybe it comes from one of my first memories as a child while watching a Nescafe advertising in the early 80’s. A steam train that advances on the tempo of the music of the Colegiala. From the first notes I would urgently come and jiggle, being totally hypnotized by this train that moves between Colombian villages and mountains. This traveling train, in motion lived the adventure! An adventure that even before I could really express myself with words had already made me dream. This connection was established and anchored in me from now on, the train is the adventure, it is the exploration of places that are unknown to me. Since then I love traveling by train … this nonchalance (probably deeply connected with the rhythm of the music for the Nescafe pub) to arrive at a destination, this constant movement immediately transports me in a kind of second state, a moment of escape from my mind while waiting to get to my destination. 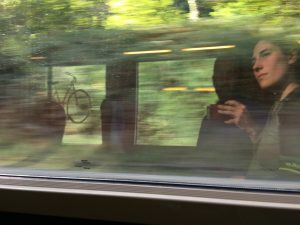 My eyes riveted on the window, I discover with wonder each kilometer, an endless contemplation, I just like the rhythm of the train. will share a moment rolling on these rails, some for a short time and with others for several hours, sometimes even for days. 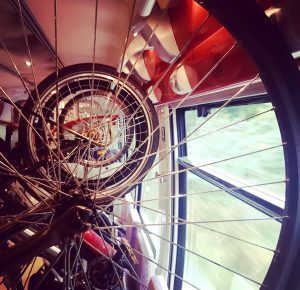 Now, traveling by train with a bike is a different story! At least getting in and out! Especially with a loaded bike, I admit that it can quickly become a hectic adventure and breathless at times. 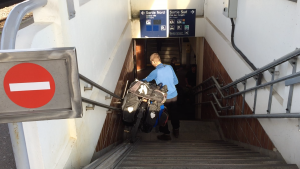 But as the train and me it’s quite a story of heart … well the adventure Bike & Rail does not even scare me! On the contrary! 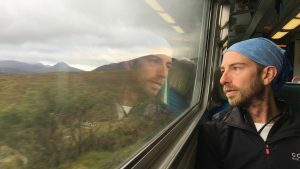 First of all, in our opinion, the most appropriate, affordable and fun way to travel Europe by train nowadays is to get an Interrail or Eurail Pass (if you are a European resident). You have the choice between: a global pass & a one country pass. Then there are time and travel options, which can be very relevant depending on how you want to use the Pass. To know that the Pass is a train ticket that allows you to travel in most European countries (see map). Also with this pass you will be able to travel in most trains at no additional cost and you will sometimes be able to benefit from reduction if you embark on a ferry for example! You will be able to board the majority of trains simply by presenting your Pass Interrail (date and journey in handwritten form when getting on the train). This allows a great freedom, change of plans and adventure! For any additional info regarding Interrail and Eurail services please visit the site. 👍with the pass we can be completely spontaneous, just go to a station and see the possible options at that moment! 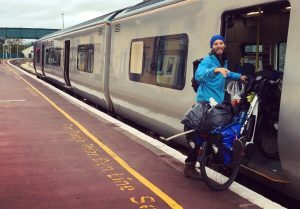 👍the adventure of buying a ticket, understanding where and how to ride the bike to get in the train is sometimes worthwhile. It also strives to really meet the culture of the country we are traveling in. This will force one to have to build a bridge in order to be understood and understand, but above all will give a glimpse of a reality of a country’s railway system. Interesting! 👎sometimes until the last minute it’s not possible to know the departure way and everything must go very very quickly (especially when you have to go down to change lanes and there is no lift;)) or when no ones knows which wagon will carry the bikes and then it is at the opposite of the train! It can be a real race against the clock! 👎Everything can be an extremely stressful moment! How many bikes on this train? Is it a separate car? 🚲We have almost never booked, we inquire very briefly about the trains with the Interrail App and/or with local railway company. 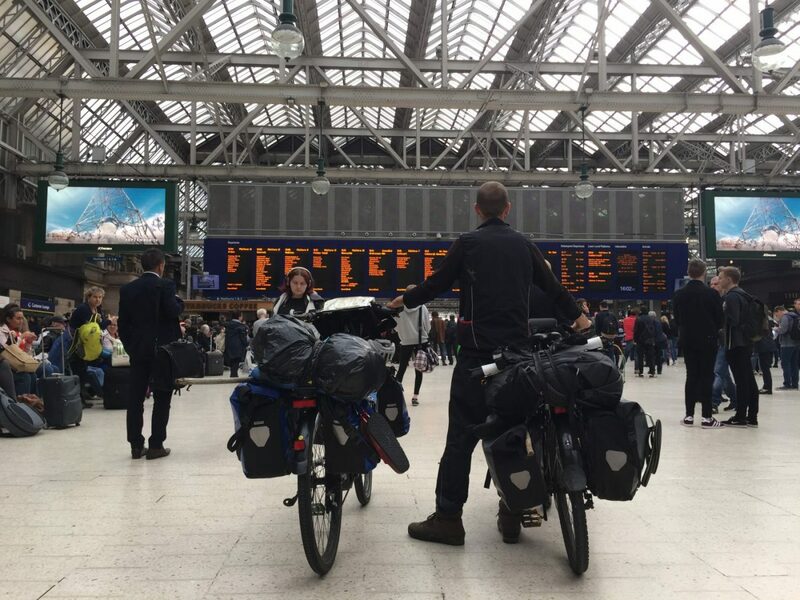 If it sounds tricky, like need a booking, we might call the train company ask about how many bicycle can be carried on the train (sometimes only 3) and maybe we will reserve. If not, only once we arrived at the train station we look at the options and go with it! Maybe 98% of the time we got the train we wanted, and reserved only few times! Watch out, like this it can sometimes be a real countdown from the moment the conversation is over at the counter! 🚲IMPORTANT TOO! Avoid the busy hours when people go to work, also Monday morning or Friday afternoon, and sometimes Sunday night are to be avoided in general, especially without reservation for the bikes! Many people take their bike to work and bike & rail! 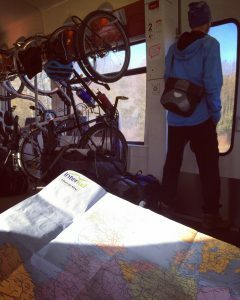 The situation in Europe when transporting the bicycle on trains will really vary from one country to another, or even from one train to another within the same country. Some countries are super bike friendly and encourage people bring their bike on the trains while others much less. 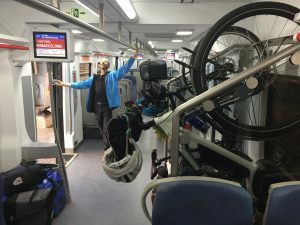 But some trains are really ideal, the entrance for the bikes is at the same height as the ground, sometimes there are cars or spaces that are specially designed for bicycles without even having to remove the panniers. Also to take in consideration that not all regional trains are slow! 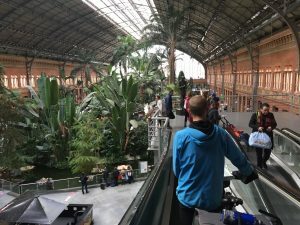 For example UK some regional lines are equivalent to fast trains while in Spain, it can take up to 8 hours to do what a fast train does in about 2 hours. In most European countries where we have bike & rail (France, Germany, Ireland, the UK, Spain) there is in principle never need to book for regional trains, nor need to dismount and neither additional charges. Some trains have special cars, some special for bikes while others can really be a bit complicated. Some times although we did not have to pay extra, we had to reserve the space as there are a certain number of places available. Reason why sometimes it’s also wise to get on at the start of the line. Since we are pretty free with our schedule, running all this with Interrail Pass has been perfect, just a bit slow in regional trains but completely doable. We had a 10 day pass over a month. In our opinion, there is not much point on writing more details about train as it changes and evolves all the time. On the other hand we strongly recommend you to look at the websites of the local railway companies which are rather well listed on Interrail once again, you will find the infos by countries. Try it and you can be sure you are going to live an adventure that you will not forget with undoubtedly loads of anecdotes you will laugh at!